An amplified dreadnought with a big American personality. The Guild D-40 Traditional embodies the features that have made the D-40 one of Guild's most beloved and revered models. Using a high-grade solid Sitka spruce top and solid African mahogany back and sides, Guild adds scalloped Adirondack braces for power, nuance and responsiveness. The D-40 Traditional's three piece mahogany and walnut neck is topped with an Indian rosewood fingerboard and is joined to the body with an authentic dovetail joint. This classic dreadnought is handsomely appointed with a tortoiseshell pickguard, rosette and binding, a genuine mother-of-pearl Guild Peak and Chesterfield logo inlaid on the headstock, and nickel-plated open gear tuners. A lustrous nitrocellulose lacquer provides an elegant finish to this masterpiece, optimizing the beauty and resonant qualities of its premium woods. 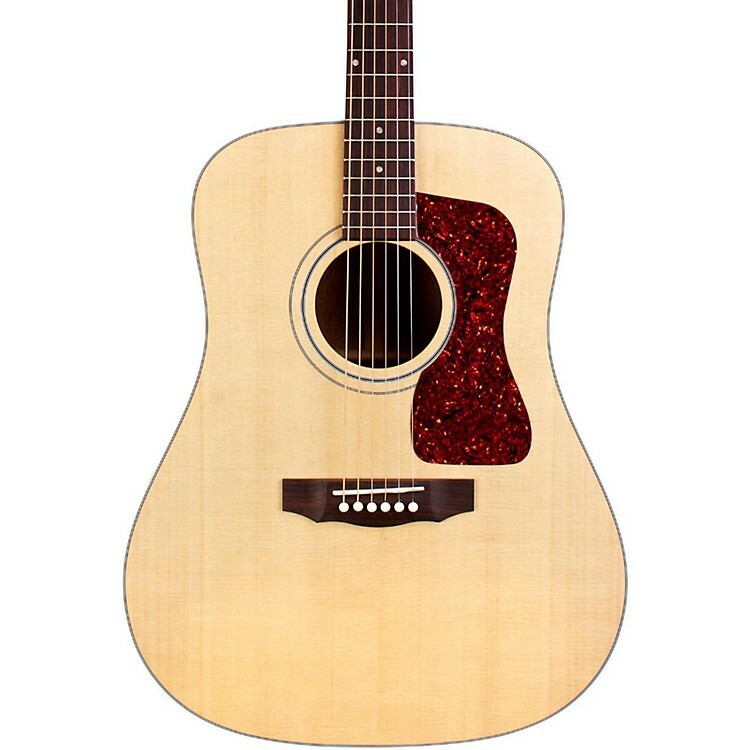 The Guild D-40E is equipped with the LR Baggs Element pickup system. Unlike typical undersaddle acoustic guitar pickups that are dependent on string compression for their sound, the Element was engineered to mirror the soundboard’s actual movement as you play. Each D-40E Traditional includes a hand-signed, numbered certificate of authenticity, and ships with a Guild humidified hardshell case. Natural top, also available in Antique Sunburst. Proudly made in the USA. A special instrument. The voice of authority. Order today.